Have you come across a program called Ecom Cash Crusher? If your answer is yes, then you might have seen their claim that it’s possible to make $2000 a day. Their claims might have gotten your attention, but you want to know if this program can deliver on their promise. 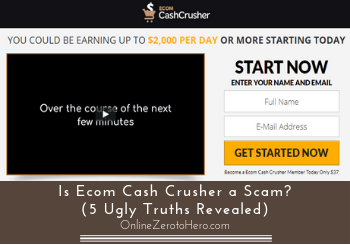 So, is Ecom Cash Crusher a scam or is it a legit opportunity that you can take advantage of? You will soon answer that question on your own after you’ve read this review. I hope all the information that I will share in this review will help you make an informed decision about this program. 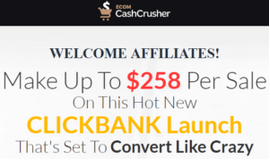 Ecom Cash Crusher is a program that claims it can provide people with an opportunity to make $2,000 per day. It is created by a so-called David Anderson and based on his sales video, this program revolves around dropshipping and creating an online store. He also claims that his program is beginner-friendly and you can easily set up everything in just 20 minutes – no prior experience in ecommerce is required. In my opinion, this is too good to be true since there are no shortcuts or secret systems that can help create an online business without investing your time, effort and a bit of patience to succeed. That is why I don’t recommend this program because it has several red flags that make it a risky investment, in my opinion. I would suggest that you find other viable alternatives on the web that can truly provide the results that you’re looking for. What is Ecom Cash Crusher and what does it offer? According to David, the creator of the program, this is the most viable system today that will change your life, and it revolves around dropshipping and building your own ecommerce store. He also says that this program is for anyone who is looking for a way to make money online, and the requirements are not too steep. According to David, you need to prior experience in ecommerce to make money online. 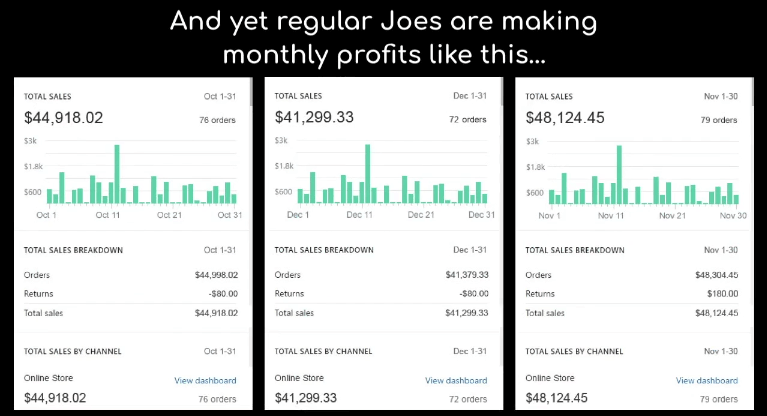 David claims that you don’t need to have prior experience with dropshipping or technical skills in creating an ecommerce site to earn $40,000 a month. You just need to follow their revolutionary system, and that will only take you 20 minutes to set up. If you’re still new to dropshipping, it’s a legit way of making money online where you sell products using your ecommerce site. But you’re not keeping a physical stock of your products. The one who fulfills the order for you is your trade partner who is also a wholesaler and most of the time their warehouse is located in another country. There are several platforms on the market that you can use to establish your online store like WordPress, Shopify, Wix, Squarespace, etc. But you’ll need to have technical skills to build a working ecommerce store. Also, this particular business model is now used by several successful online business owners, and most of them are earning a lot of money through dropshipping. Although they have achieved that level of success through hard work, proper training, and patience, they didn’t rely on automated tools and secret systems to do the work for them. However, this is not the case with Ecom Cash Crusher because David will tell you that it’s so easy to create an online store and earn a decent income online. You only need to follow his revolutionary system, and you’re all set for success, which, in my opinion, is too good to be true. I’m not saying that it’s hard to build an ecommerce store, but you can’t do it in just 20 minutes like what David claims on the sales video. The first time I visited the sales page of ECC, I was a bit skeptical – especially when I saw the outrageous income claims and the so-called revolutionary automated system that come with it. If you’re like me, you would do your part by doing your research and search for valuable reviews on the web that can aid you in your decision-making process. Fortunately, you don’t need to wander the web because I will share with you in this review some of the red flags I’ve uncovered when I did my investigation on their sales page. In my opinion, It will give you an idea of what you can expect from this program and help you make the right decision. Here are some of the red flags that I have uncovered from their sales page. Red flag #1 – Is it easy to set up an ecommerce site? According to David, this program is created with the beginner in mind so he claims that everyone can easily set up an ecommerce without prior experience or technical know-how. In fact, you only need 20 minutes a day to set up everything and thanks to his revolutionary system; you don’t need to do anything else but to wait till the money pours into your account. Some of the income claims on their sales page. If you’re observant enough, you’ll notice that he only tells you the positive outcomes, but he is not interested in showing you the process on how his system works and the requirements you need to fulfill on your part. It’s fascinating to see all those income proofs from their testimonials, but we can’t verify those claims until we see the back-end of their dropshipping site or if those so-called members do have an ecommerce site. Based on my own experience as an affiliate marketer, creating a website is not that complicated, but without training and some technical-know, it will be difficult. You’ll need to spend some more on hiring a freelance web developer to help you build your ecommerce site. Not to mention the costs of hosting and promoting your website on the web. In my opinion, starting an ecommerce site requires some form of training and technical skills to set it all up in a platform like Shopify and WordPress, so it’s safe to say that this program is NOT suited for absolute beginners. That is why you’ll need to consider this red flag when you’re planning to join this program. Red flag #2 – Are they using fake testimonials? In their sales video, you will also see several testimonials from their so-called successful customers. These people claim they have earned a lot of money using the system, but the validity of these testimonials is questionable. 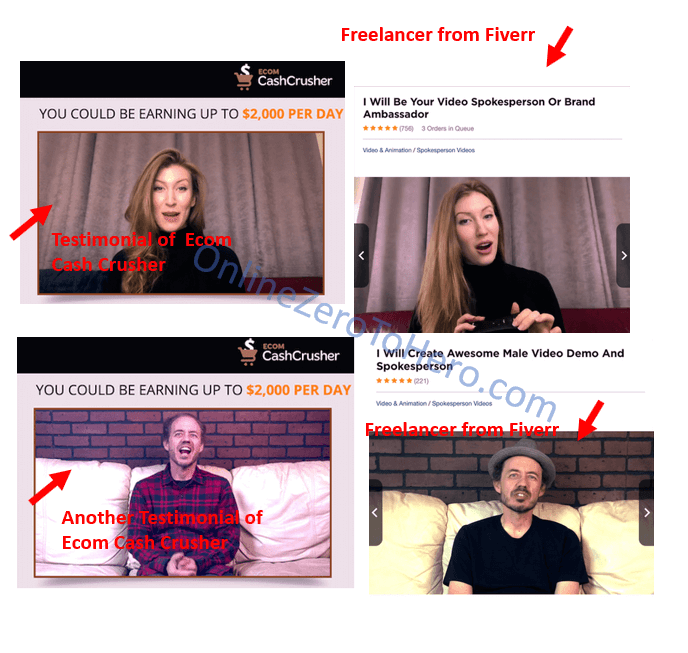 Since I’ve been reviewing a lot of programs with the same business model as Ecom Cash Crusher, I recognized some of them and they are freelancers from Fiverr, so these people have been paid to do these testimonials. They are using Fiverr freelancers to do the testimonials for them. Honestly, they are impersonating customers to lure people closer into the program and hopefully get them to buy the product. As for me, it is a cheap and unethical way of gaining your trust so I suggest that you take this red flag seriously because using fake testimonials is NOT something that we can tolerate. In my opinion, it gives a clear signal of what you can expect from this program – especially if you’re very particular with transparency. Red flag #3 – Is $37 enough? Your initial cost for this program is $37, but that’s just your initial payment or more like your entrance fee to their membership page. Once you’re inside their membership site, you’ll be able to access their training videos which mainly tackles dropshipping. So, David’s secret system is a training program about dropshipping where he will teach some of the methods he used in this type of business. The initial fee that you need to pay for this program is $37, but that’s just your initial payment to their membership page where you can access their basic training videos. They are willing to pay their affiliates $258 per successful conversion.